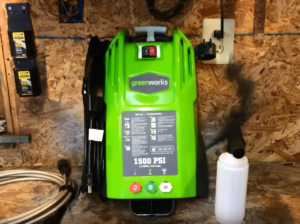 Was walking through Lowe’s one day shopping for some light bulbs, and stumble across this little devil on clearance for $79… The GreenWorks 1500 PSI pressure washer. One thing to remember is that you’re dealing with a 1500 PSI electric pressure washer, not a gas powered monster. Keep that in mind if you’re looking for something a little smaller to wash your car with. This is a really great pressure washer for the right person. Looking to wash algae off some bricks? Perfect. Washing your front porch? Great. Washing some sun chairs in your backyard? Exactly. Enjoy washing your car every week? Yep, this is a great pressure washer for you. Any garden hose connects to it just like most pressure washers – the hose that comes with the unit is 20 feet long. I found it to be more than enough when washing my car. In theory you could replace this pressure washer’s wand with any other one of the same pressure rating and it will function properly. It comes with a little detergent bottle that fits into the wand handle and sprays detergent foam at a low pressure. 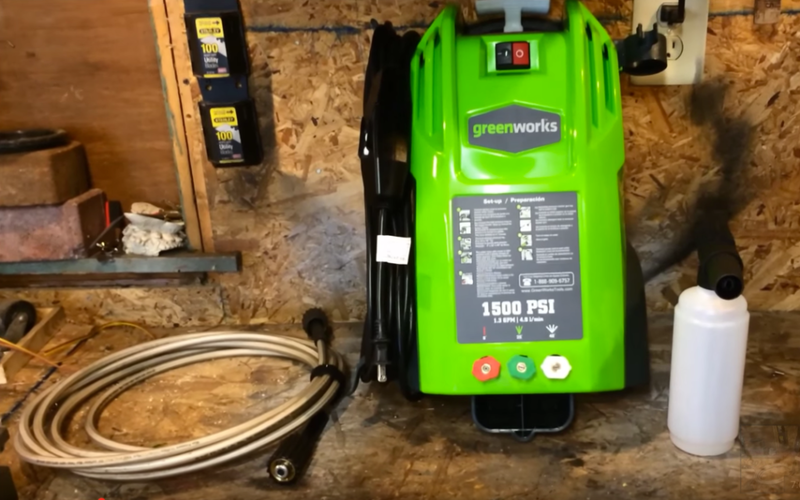 I’ve included a link to a video of a young guy washing his car with the GreenWorks 1500 PSI pressure washer and also using it as a foam cannon… if you’re looking to wash your car with this pressure washer, scroll down and check him out. Typically you would use this washer as a foam cannon to spray soap foam over your car, then once you have a nice cover of detergent, you remove the foam cannon, and replace it with a regular 40-degree nozzle and spray down your car, deck, whatever and rinse it off at a higher pressure. Note to car owners: I’d advise starting with the 40-degree nozzle on your card, as it will spray water at a lower pressure. If your car is caked with mud and the 40-degree nozzle doesn’t work, then okay… snap on the 25-degree and everything should be fine but do take note that paint condition could be a factor here and it’s possible (though unlikely) you start stripping the paint off… so maybe try it on a small corner of your car to make sure that everything’s fine before pressure washing a giant line down the side of your wife’s Toyota Camry. Like most pressure washers the first thing to go is the hose, and you can buy replacement hoses online or call Green Works directly at +1-888-909-6757. Tell them Mike from Best Pressure Tools sent you! Ok, enough blabbing… Let’s see it in action! 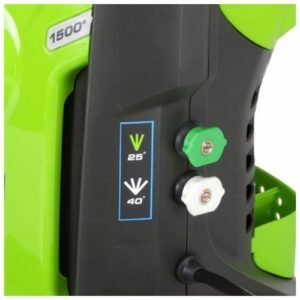 The GreenWorks 1500 PSI pressure washer comes with two nozzles: The first (white) is a 40-degree nozzle which gives a softer pressure and the other (green) is a 25-degree nozzle which has a stronger pressure. You remove them from the body just by turning them and then pulling them out – it’s a pretty snug fit so give it a good pull to make sure before you give up. To insert a nozzle, pull back the brass end of the wand and let it snap back into place over top of the nozzle (similar to how a snap-in hose connector works). When installed properly the color and will be facing away from you. The pressure washer hose snaps into the spray wand, and your house hose snaps into the side of the washer. Should make sense, but if not, leave a comment. It weighs about 20 pounds and doesn’t have wheels so if you wash your car once a week/month this may not be a deal breaker, but if you’re running a small pressure washing business I’d recommend spending a bit more and investing in a pressure washer with wheels. This washer comes with a 20 foot hose that connects to the wand, which isn’t huge but isn’t too short either – it’s a pretty standard length for a pressure washer. These are pretty standard technical specifications for an entry-level pressure washer. Something to note: The company who makes this pressure washer, GreenWorks, advised me not put water which is hotter than 104 degree Fahrenheit (or 40 degree Celsius) into this pressure washer, so if you need a really hot water pressure washer, here that’s something to keep in mind. In full transparency, I’ve never used a pressure washer with hot water, so I don’t know much on this topic. The one thing to take note of here is that this pressure washer isn’t built for cleaning a giant construction site or cleaning a giant cement floor (a warehouse) or a 4-car garage. This is an entry-level pressure washer and that’s all it claims to be. Just wanted to clarify that because if you’re looking to buy a washer and your only experience is coming from a gas powered pressure washer, then you’re going to find this one a little dinky/underwhelming. Coming from a gas powered pressure washing background myself, and having another pressure washer to use I’m obviously not going to make this my day today pressure washer, and if the purpose of buying yourself a pressure washer is to use it for your small business I highly recommend spending that extra bit of money, as this unit simply wouldn’t be able to keep up with huge a large construction job’s needs – I’m guessing it’d overheat long before you’re done with it. Love the portability of this pressure washer – I found it kind of charming after using a pressure washer with wheels for so long. Knowing the user has to pick up and put down this pressure washer, they built it a lot lighter than a typical pressure washer with wheels. Because of this, when I was washing my car I found it nice to only move it twice. Twenty feet of hose is plenty to move around otherwise. This pressure washer works well as a foam cannon on smaller jobs. I saw a guy on Amazon complaining about the foam cannon not working, but that wasn’t my experience… I loved the foam mine produced. The guy on YouTube below does a great job with the very same pressure washer, so I’m guessing any issues are most likely something to do with their detergent mix – or perhaps his hose had really poor pressure? – either way his experience differed from mine and I think this is a great pressure washer to use as a small project foam cannon. 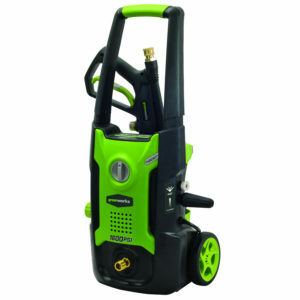 So now that’s all been said… what’s the verdict on the Greenworks 1500 PSI pressure washer? I think this is a great choice for small jobs around the house. 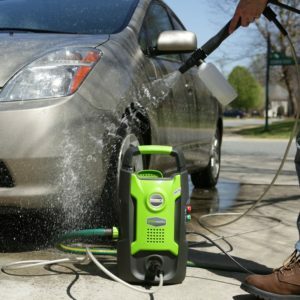 If you’re a car fanatic who wants to move from washing his car every month to washing it every week and you can’t find the time, a pressure washer’s really going to free up time in this type of lifestyle… I think this is a great entry-level pressure washer to dip your feet into the water with. Overall I think this has earned its 4.2/5 Stars on Amazon. I couldn’t ask for much more from a pressure washer under $100.